I love the European signs indicating when you arrive in a village or town, and when you leave, like this sign that I’m just a meter or so from existing the town limits of “Ston”. I loved my time in Ston and Mali Ston, and this pass through I barely have time to stop, save to capture this shot. Doc is loaded, battery charged and clutch cable ready for my journey north, east, south, and west. Traffic and big trucks torment me as I wind my way back north to the Pelješac peninsula. Yesterday I connected with a young winemaker whose family for three generations crafted wine from the venerable Plavac Mali, a grape varietal only found here in Croatia. Since breaking through the Bosnia border to Croatia just over a week ago, I’ve savored and enjoyed Croatian wines made here in southern Dalmatia. The whites, reds, and rosés are inspiring and exciting. With its southwesterly exposure, rocky soil, and proximity to the Adriatic, the Pelješac peninsula is a near-perfect grape growing region. The road clings to the steep cliffs. There are too few straightaways and too many southbound cars making it difficult to pass. I yearn for the spirit of the open road, with nothing ahead of me, and no vehicles in my rearview mirrors. 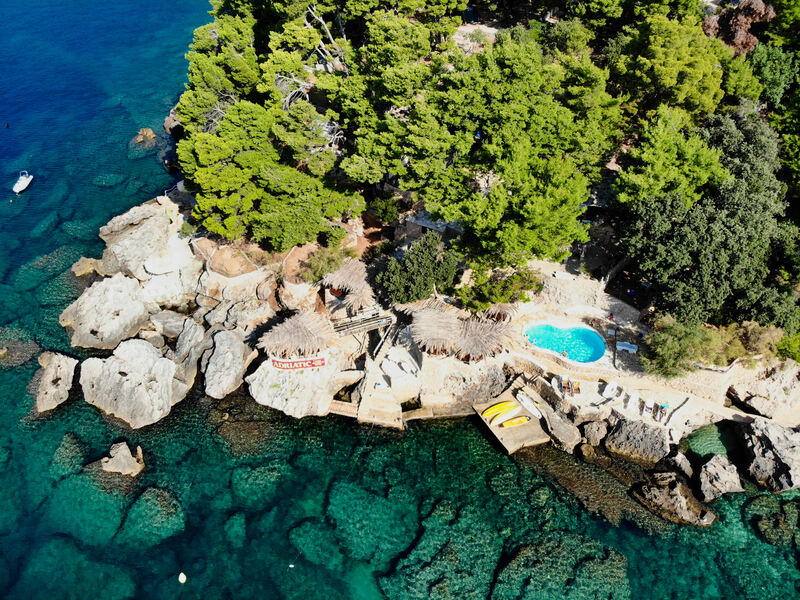 Little islands dot the Adriatic like spots on Dalmatian dogs. It doesn’t take much imagination to figure out why they named this the Dalmatian coast. Or does it? When I reach the turnoff for the Pelješac Peninsula, I pass the road to Mali Ston. I want to stop in and say hi to Mr. Kralj and thank him once again for his hospitality and friendship. But I’ve promised Antonio Mikulic of the boutique winery Mikulic here on the Pelješac I’d be there earlier, rather than later. 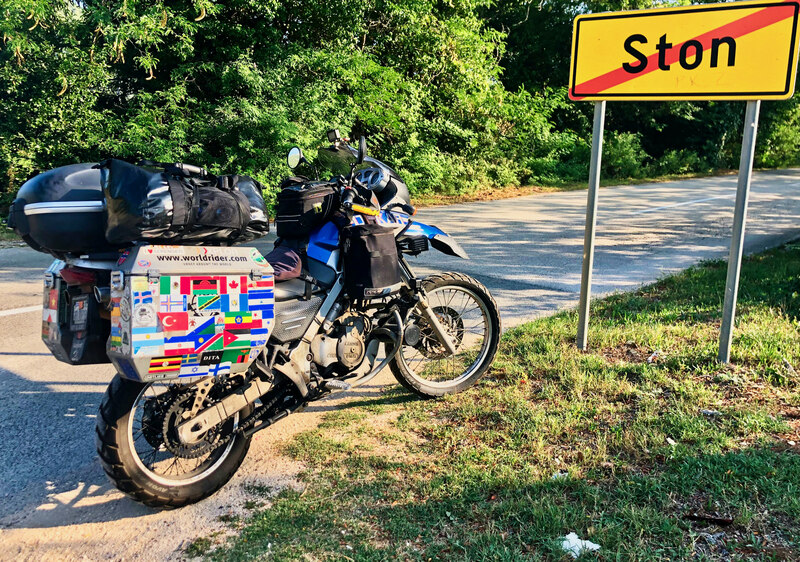 In Ston, I stop to use one of the few ATMs on the Peninsula and then motor north toward Orebic. Just outside of Ston the traffic fades, and the road opens. I breathe free, flip up my face shield and roll the throttle as my bike, Doc, speeds forward. Fertile, terraced vineyards climb gentle slopes, and farmhouses dot the roadside. I downshift, slow, and putt through a little settlement of Metohija where tucked at the bottom of a craggy hillside sit a cluster of stone houses. As I continue to roll, I notice signs for wineries, Androvic, Milos, and pass a small market. I make a note to myself as I pass a turnoff for Dingac, a designated appellation for growing Plavac Mali grapes, to return and ride through the tunnel that takes cars to the steep and rough terrain—home to vineyards from where some of Croatia’s best red wine comes from. It’s 4 pm when I get to Mokalo. I make a sharp left turn and drive down a steep driveway toward the sea. The driveway carves its way through a vineyard, olive trees and past a few stone buildings until it ends at the parking lot of the Holiday Resort Adriatic and Mikulic boutique winery. I park next to another BMW GS motorcycle with Italian plates. I’m here to meet winemaker Antonio Mikulic, and learn about his wine, family and the region. Antonio is busy when I arrive, but his mother, Sabrina, offers to take me to the winery and through the vineyard. “I know little about wine,” she admits. Though dressed casually in shorts, a t-shirt, and sandals and wearing her auburn hair in a bob that frames her delicate face, she evokes an air of understated elegance as she steps behind the bar in the new winery and tasting room. She keeps apologizing for her English, though I understand her. She asks me if I speak German as it would be easier for her. I don’t. She pulls a bottle of wine off the shelf, puts her reading glasses on, looks at the label, grabs a corkscrew and pulls the cork from the bottle. She pours wine into the glass, sniffs, smiles at me and continues. “The winery is new, we opened March 2nd last year” she explains, as she pours me a glass of the family’s Postup, a deep and dark red wine made from Plavac Mali grapes. We toast, I ask her if I can take her photo, she insists on taking her glasses off before I do. “Antonio knows more,” Sabina notes. “I work with the apartments and campground,” she shares. 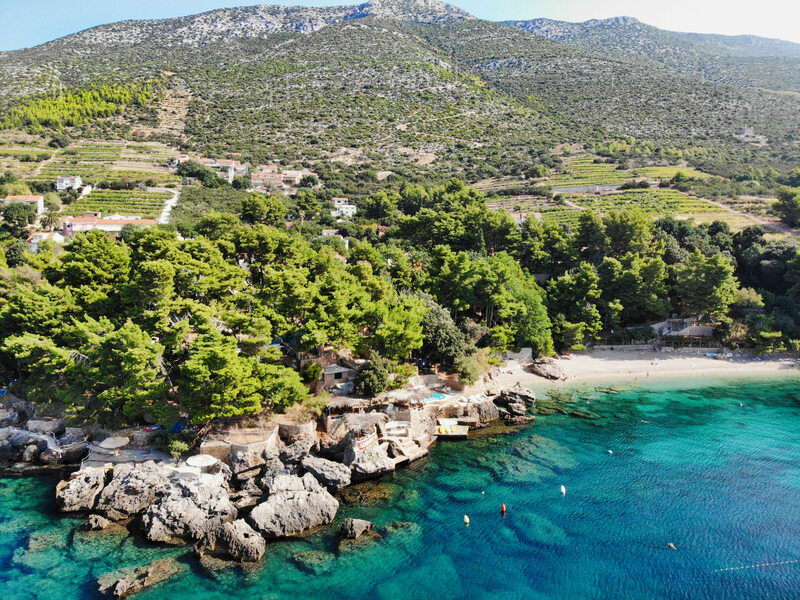 The Holiday Resort Adriatic includes this winery, a hotel with apartments, a campground, beachfront restaurant, swimming pool, and beach. Sabina sips the Mikulic Postup, closes her eyes and contemplates. She tells me she knows little about wine, but her expression tells me more. 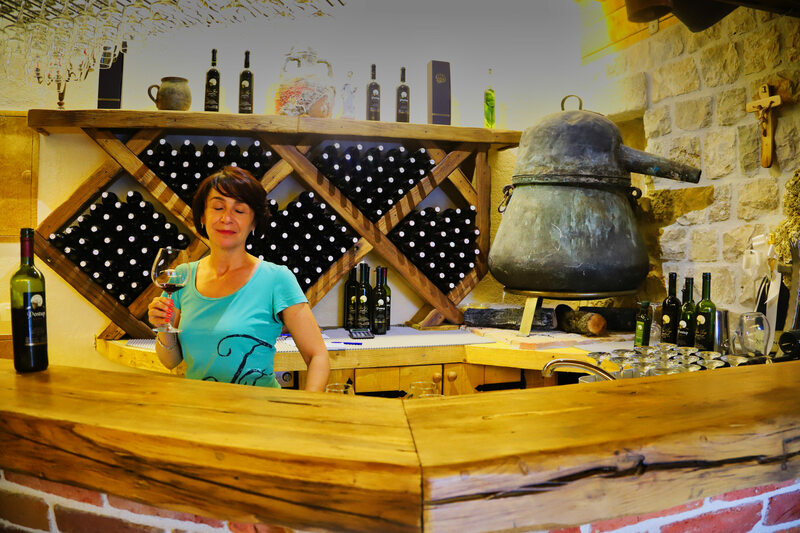 Here in the winery, they make wine, Rakija, and olive oil. She points to a sparkling new industrial meat carving machine, designed to carve whole legs of pork, like prosciutto. “Antonio wants this machine,” she tells me, “This is very expensive, about six thousand Euros. She points to the hind leg of a hog hanging from the ceiling. “This is the best,” she explains, “from our friend who has a farm, it’s all natural, no pesticides.” She tells me that tourists come to the winery taste wine, try the prosciutto-like cured ham, and other delectables. Sabrina explains that her father-in-law, now 84 years old used to make the wine, but only for the family’s three restaurants and for personal consumption. He never bottled the wine until recently. In 2012, his wife passed away, but just two years ago he found another woman. “He’s in love again,” Sabrina shares with a roll of her eyes and a smile, “Now he doesn’t have time for making wine.” So when Antonio returned home from Zagreb where he studied hospitality business, he discovered a new love—making wine—and learning from his grandfather. She points to a photo on the wall of the winery, it’s Antonio and his grandfather in the vineyard. The winery wreaks history, and due to artifacts and several antiques, it feels like a museum. Even though the building is new, it has a rustic atmosphere due to dark woods and several artifacts, including an amphora, a winemaking relic from a shipwreck in the Adriatic, old wine barrels, and an antique wine press. This photo graces one wall of the Mikulic Boutique Winery on the Pelejac Peninsula in Croatia. 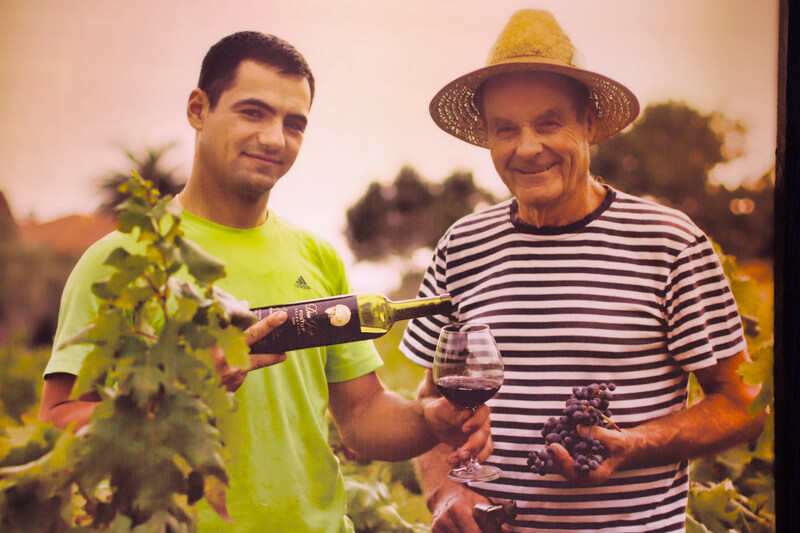 It’s Antonio with his grandfather—the inspiration for his venture into winemaking and wine appreciation. He bought the antique press when he was 24 years old, sixty years ago. It was the first major purchase he made once he earned money. Even sixty years ago the press was old—real old. It dates back about three-hundred years old, about the last time this area was under Venetian rule. Until a few years ago, he still used it to press grapes harvested from the family vineyard. 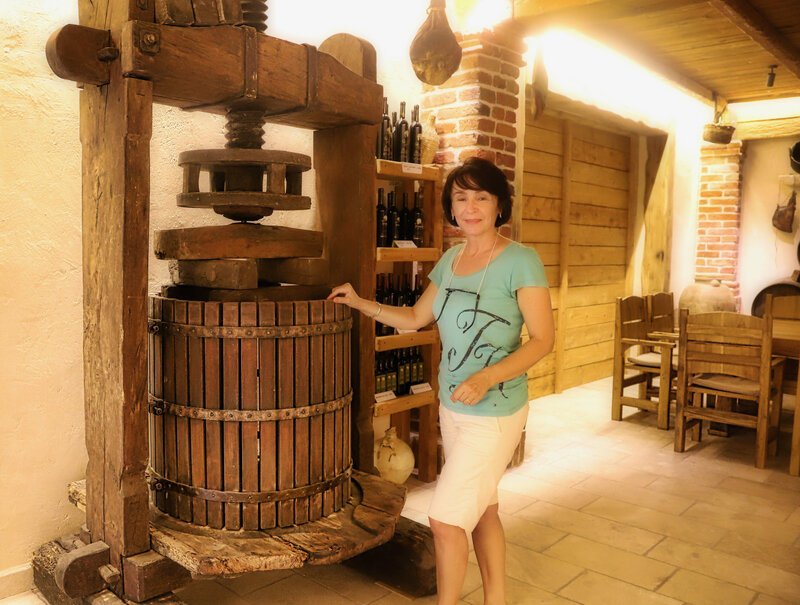 This wine press, used by her father-in-law until just a few years ago dates back some 300 years old to the time of the Venetians here in Croatia. We talk about her family. Her husband and daughter manage a boutique hotel and restaurant about 10 kilometers northwest of here in nearby Orebic. She and Antonio manage the winery, hotel, campground, and restaurant here. They also have a scuba diving center, a fishing boat, kayak rentals, and water skiing. “In ten days Antonio will begin Harvest,” Sabina explains as we exist the winery and walk up the driveway to the vineyard. She shows me some old vines and ripe grapes. Olive trees line the other side of the driveway, and the vineyard climbs up the steep mountain on the other side of the main road. Later, Antonio tells me that the grapes and vines up there are much smaller and older. The vineyard is about thirty to forty years old, these are the original vines. I walk back toward my bike, reception and through the campground to the restaurant. 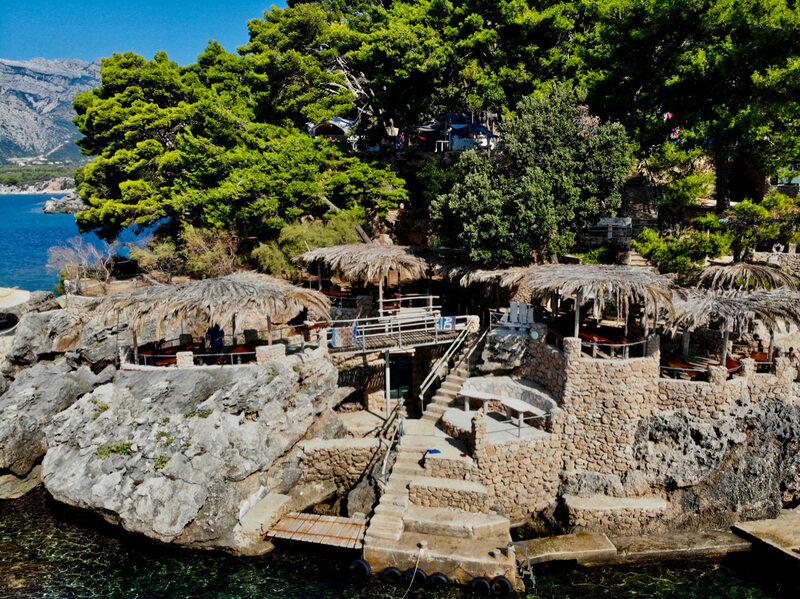 Several tables are neatly tucked on a few levels under thatched-roofed palapas, among rocks, several are jutting into the Adriatic. On the lower level, sunbathers lie around a swimming pool. The setting is stunning on a rock cliff some twenty feet above the surf. While the wine is outstanding, the food served at this stunning location is off the charts. Antonio joins me at a table overlooking the Adriatic. It’s quiet, save the muted crying of a baby, probably in the campground. He is handsome, young, and with commanding energy, as he jokes with customers, directs his staff, and tends to my curiosity. The best part is, he’s only twenty-three years old. “Are you hungry, Allan?” I nod. “What you like?” I acquiesce. 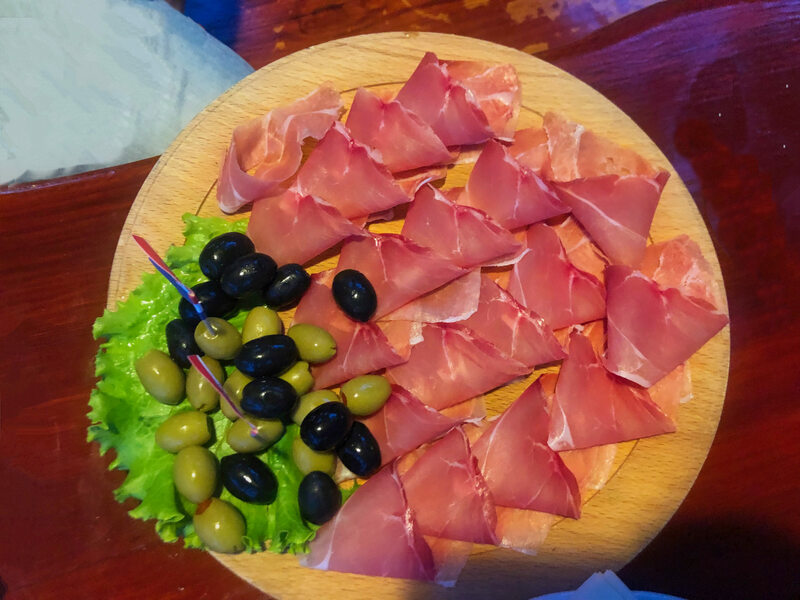 Antonio and his team at the Adriatic Holiday Resort source carefully cured ham, like prosciutto from Parma, from local organic farmers. He gets up to tend to business in the kitchen. A waiter places a plate of sliced prosciutto, olives, and other snacks in front of me. I’m sure the cured ham is from the all-natural farm his mom told me about earlier. “I always like to start out with white, but end up with red,” I describe my dinner wine preference and practice. I’m surprised when the waiter brings us a non-labeled carafe of white wine and a bottle of sparkling water. “We don’t make white wine,” Antonio explains. We buy this wine from our neighbor. He fills a glass about half full from the carafe. He then unscrews the cap to the sparkling water and fills the rest of the glass, mixing it with the wine, with sparkling water. I have to carefully compose myself, hide for a moment my horror. I imagine this is the guy who at 23 years old is making wine from a multi-generational vineyard here in Postup, one of the best wine-growing regions in Croatia, and he is watering down his wine. To me, this is desecration. “This is gemišt,” he tells me. I’m still dumbfounded, as this is the first time since traveling I’ve seen winemaker water down his wine. “Is that the grape,” I ask assuming Gemišt must be a white wine varietal. “No, this is what we call a mix,” he explains referring to the loose translation of the word. “When it is hot, we like to mix our wine with water.” Later I learn that some Croatians do this with red wine where they mix it with still water and call it bevanda. It’s like a wine spritzer, once popular in America before my country’s palate warmed to the notion of quality wine. “You try?” he asks. I tell him I’d like to first try the wine unadulterated. It’s okay, at best. Fair. I would instead, like to try a white wine from the nearby island of Korcula, preferably from a bottle, but I’m the guest. After finishing half the glass, I grab the sparkling water and fill my glass. I’ll drink the gemišt. I disclose my dirty beer secret, “I like beer after a long hot ride on the motorcycle. But when I’m home, I hardly ever drink beer. Rose,” I explain, ”is like beer for me.” We toast to our common ground, filling up our glasses with a bit of white wine and then topping it with a good dose of sparkling water. “Next year I would like to make a white wine,” Antonio tells me. 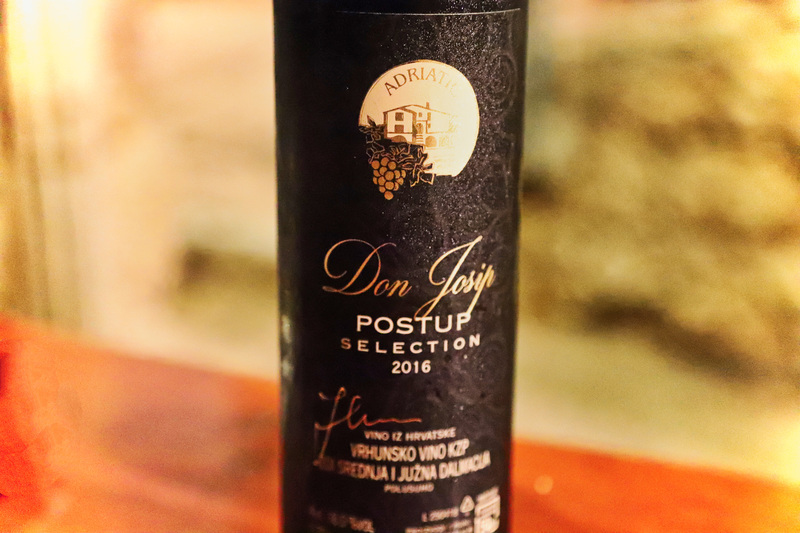 “I will buy grapes from Korcula and make small production of Posip,” he explains mentioning the white wine from Korcula I honestly wanted to try. Next year I must return. “My grandfather makes white wine, only about 200 liters a year, but just for himself.” I want to ask him if he mixes it with sparkling water, but bite my tongue instead. “Making red wine is easy,” Antonio says. “If you have a good vineyard, good grapes, good position, you can make good red wine with your eyes closed,” he speaks with confidence. “But white wine?” He pauses. “This is much more complicated.” He tells me it’s hard to find expensive white wine in Croatia, but good red wine will command higher prices. While there are hundreds of years of history of winemaking here, most of the wine was not of good quality. Beyond what people made for their own consumption the would haul the grapes to the port in Orebic and sell and ship the wines to Italy, Greece, and beyond. The buyers knew the position of the vineyards here in Mokalo, Postup were higher quality and would pay more per kilo for the grapes from here than from where his grandfather was born. Sometimes, buyers rejected the lesser quality fruit. So, at seventeen years old, Antonio’s grandfather moved to this village to work in the vineyard. It was here, on this property he met Antonio’s grandmother. After a year they got married. They were very poor, and for the first few years, they lived in the barn with the cows and the sheep. “There was no swimming pool either,” I joke. Antonio laughs. He’s giddy when he tells the story. And when he laughs. his voice raises a pitch and his eyes squint, and he rocks back and forth in his chair. They built one room, then added another. Then they built a house. Soon Antonio’s father was born. His father liked to fish, and when he was older, he became the grill master of the area, opening a small restaurant with just four tables in front of their house. Today the Mikulic family lives and breathes hospitality. Everyone in the family works for the family business. Antonio admits that at first he did not like, nor drink red wine. But after returning from hospitality school in Split and Zagreb, his grandfather asked him to help him in the vineyard and with making wine. They had to truck the grapes 15 kilometers down the road where they could make and store the wine. At the time, his grandfather never bottled the wine. He served it in a carafe as ‘open wine’ in the family restaurants. The stunning sea and cliffside restaurant, pool and much more of the Adriatic Holiday Resort and Mikulic Boutique Winery in Mokalo Croatia. “When I eventually try my grandfather’s wine—red wine—the lights went on,” Antonio reveals the illumination and epiphany he felt when he realized the beauty of the family vineyard. He realized why his grandfather obsessed and lived with a passion for grape growing and winemaking. His grandfather explained that due to the rocky soil, south facing position and steep terrain of the vineyard, and its proximity to the sea, the wine made from the Mikulic vineyard is perhaps the choicest in Postup and one of the best on the entire peninsula. His realization not only fired up his passion and appreciation for red wine—but also the possibilities for the family vineyard. Antonio leans closer as a waiter brings me my next course, an octopus salad. This is a traditional recipe for the area, but different from I’ve had before. It is less salad and more like a ceviche, though the octopus is parboiled, not cooked in citrus. It’s fresh, clean, and a delightful pairing with my spritzy wine cocktail. “Croatians don’t like to put lemon too much on food,” he tells me. Still leaning forward, and almost whispering, “Now I must go study winemaking,” he tells me. “I want to go, but I don’t want to go. He giggles, rocks back and forth. As I gaze around the restaurant, it’s hard not to notice the elaborate stonework, from the flooring and walkways to the staircases and the beautiful patio that surrounds the pool perched high on the cliff. I remember walking through the campground with its level campsites, complete with electrical hookups, fire rings and all shaded under mature trees. Then there’s the winery, with its high-ceiling, wood beams, attention to detail everywhere, and in the ancient artifacts. When Antonio graduated from school and chose to take over winemaking from his grandfather, to support him, his parents secured the money and invested in the winery, to continue the family tradition. Fresh, crisp, and tasty, the octopus salad is the perfect complement into my foray into gemišt—don’t tell my wine geek friends, please! 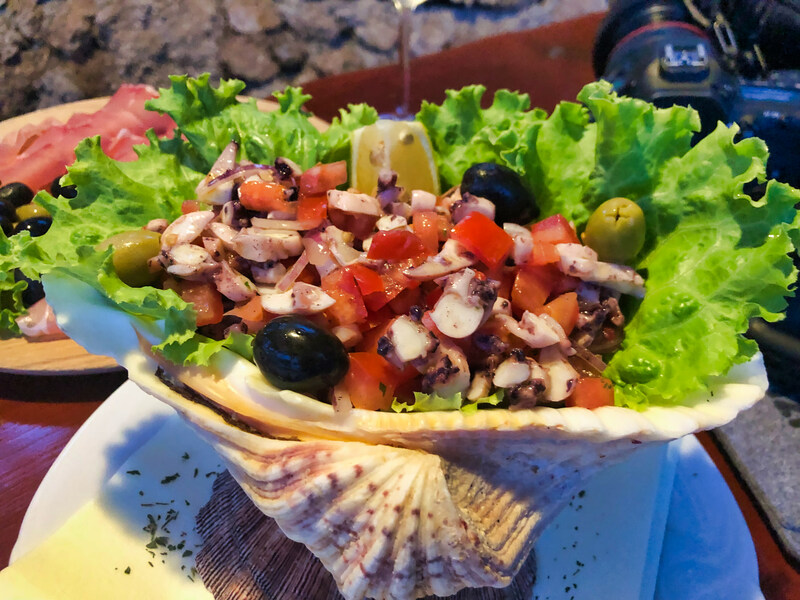 As we talk, I dig further into my octopus salad, tasting the sea and fresh ingredients with each bite. I confide in Antonio that when I contacted him, I did not consider that my experience here on the Adriatic would be much more than just vines, wines, and a winery. You are ready for red wine,” Antonio’s eyes widen, he flashes a bigger smile as he pulls the cork from his signature wine, the “selection,” the “Don Josip.” He pours me a glass. The aromas of dark berries, cherry, mocha and a hint of eucalyptus explode from the glass. I sip. It’s mouth coating delicious, medium to full-bodied, with good complexity and layers of dark fruit and a hint of earth. It’s lovely. “When my grandfather made his wine, he put all the juice in the same barrel,” Antonio shares how he came about the “Don Josip Selection.” “When I realized the grapes grown at the top of the hill, on the other side of the road, and were much different from the grapes grown closer to the sea, I asked many questions.” He holds up his fingers and shows me how small the grapes are at the top of the hill.” He then spreads his fingers wider, indicating how much bigger they are at the bottom. “I ask my grandfather why he puts all the grapes together,” Antonio suggests that they separate the grapes and make two red wines. Grandfather is stubbornly hesitant, doesn’t want to change the way he’s been making wine. So Antonio convinces his father to indulge in his experiment. As I listen to his story, I have a hard time believing just a few years ago Antonio didn’t like or drink red wine. He and his father agreed to experiment with just 100 liters. So, together the two of them went about the laborious process of hand selecting and sorting grape clusters, reserving the smallest and gnarliest looking berries for the new bottling. The experiment was a success, and it impressed even his grandfather. 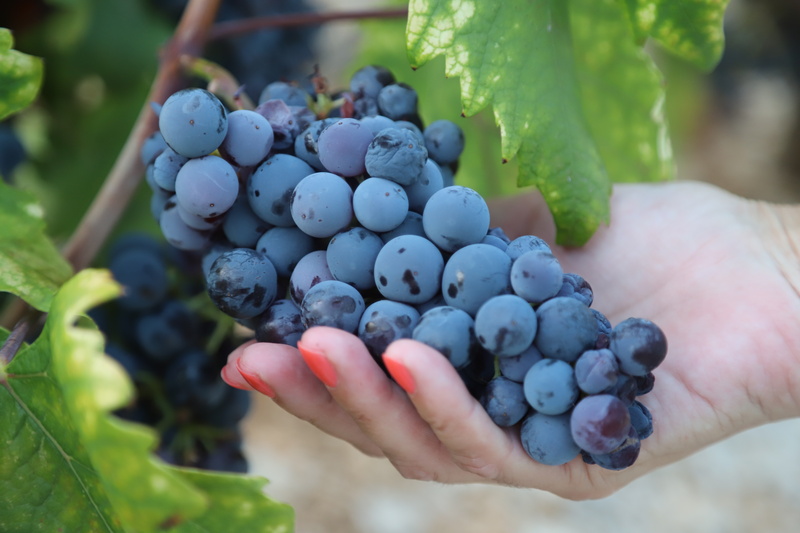 “Plavac Mali needs two years before it’s ready to drink,” he explains, referring to the grape variety that goes into making his Postup red wine. Two years, some in barrels, some in stainless. But at least two years. 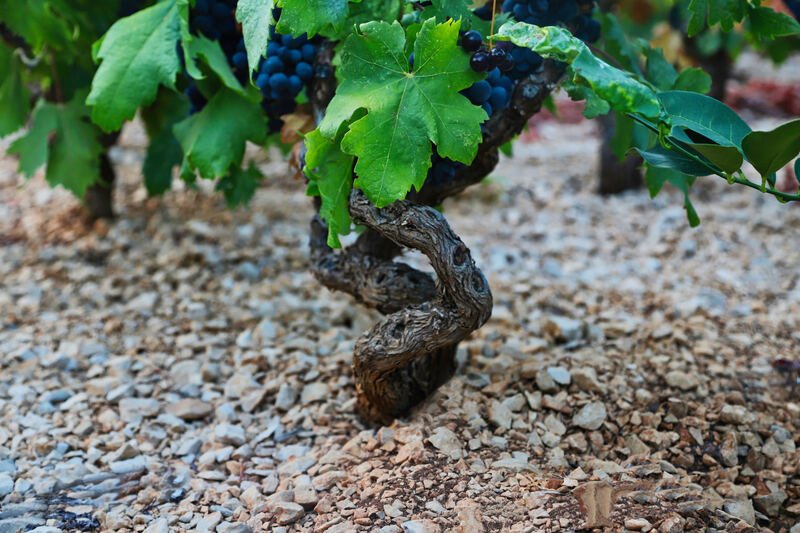 The following year, Antonio produces almost four-thousand liters of the Don Josip Selection. Before it’s ready, according to his own standards, he enters the wine, only the second vintage he’s ever made, into a Croatian wine competition. “We won the gold medal,” his face glows. “I can’t even believe it!” e’s proud but surprised and humbled, at the same time. 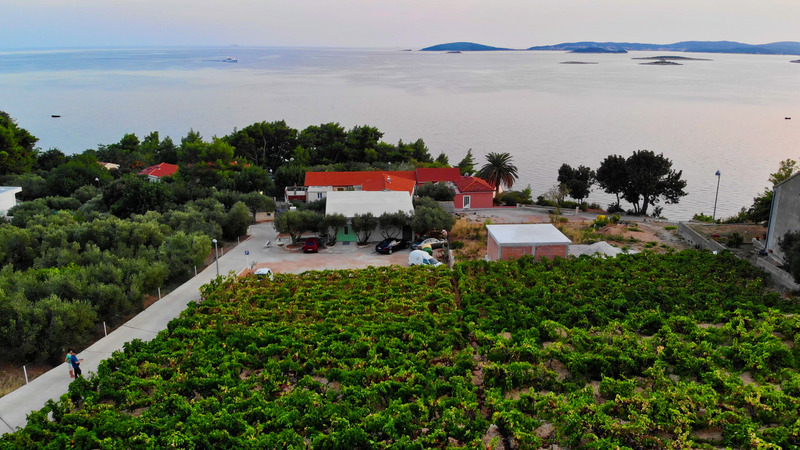 The all Croatian wine competition included 410 wines, they bestowed the honor of a gold medal on just 26 of the wines entered, placing his 2016 Plavac Mali, Postup, the Don Josip Selection, in the top seven percent of all Croatian wines. The waiter drops my next course in front of me as I’m swirling the gorgeous Don Josip Selection Postup Plavac Mali. It’s a whole fish, sea bass, caught today by a local fisherman. Served with grilled peppers, eggplant, and a potato rice pilaf. I tell Antonio I’m a lazy fish eater, preferring filets often over full fish. “I don’t like the bones,” I confide. 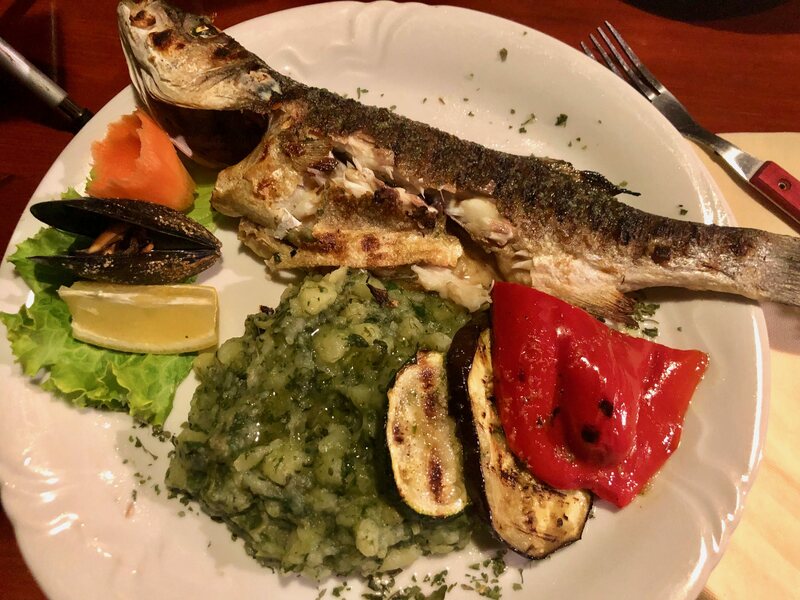 This tasty fish, sadly, was brought to this restaurant just a few hours before the talented chefs grilled it to perfection. I dig into the fish, it’s cooked perfectly, tastes so fresh and the perfect complement to the conversation and wine. The bones aren’t a problem. As the evening continues and our conversation carries on, becomes more spirited, and deep, it occurs to me that at twenty-three years old, Antonio has the wisdom and intellect of an old soul. Our conversation shifts to change, travel, and openness. These are all big concepts so important to me that often I think they drive me, if not define who I am. Antonio gets it, too. “My father is a traveler, he’s traveled the world,” Antonio turns serious. “He says if you stay at home you can learn nothing, you cannot see anything new, you cannot see the future of business.” His father encourages him to travel so he can see what other regions and countries are doing. “If you are doing the same every year, you cannot grow. You must make or do something new every year. When you travel the world, you take ideas from here, there and everywhere.” He says this is not just for business, but for life. I share with him nausea I experienced from watching people take selfies or smacking me in the face with a selfie stick when I was in Dubrovnik. “Dubrovnik is something different,” he concedes, “they have tourism 365 days a year. Here, our season is March or April until end of September.” He gets to travel in the off-season. Postup vineyards are uniquely positioned and are south facing, with rocky and harsh soil and terrain and climb up steep hillsides. At Mikulic you can see in thsi photo the terrain and its position to the sea. The Adricatic acts like a massive reflector giving the vines more than 14 hours exposure to the sun during the summer. In 2017 there was a stretch of 100 days without rain, while yields are low, Antonio tells me the quality is amazing. Yes, every day I start with the broom, sweeping. I asked what he did with the money he earned. “I bought a kayak,” he explains. His kayak was added to the resort’s fleet of rentals. The money earned from the rentals was proportionately split with his father. With that money, he would eventually buy more kayaks. One day he approached his father with an offer to buy his kayaks. At first his father refused, but finally, he gave in. True to his philosophy and belief, Antonio brings something new to the resort every year. Now they have a dive center, a speedboat for water skiing, and the winery—where he along with his grandfather bottle all the estate wine. None is served in carafes. “With the wine in the bottle, we can present the wine,” he tells me. I add that you can also get more money for a bottle of wine. He agrees and tells me he could charge even more for his wines, but he won’t. 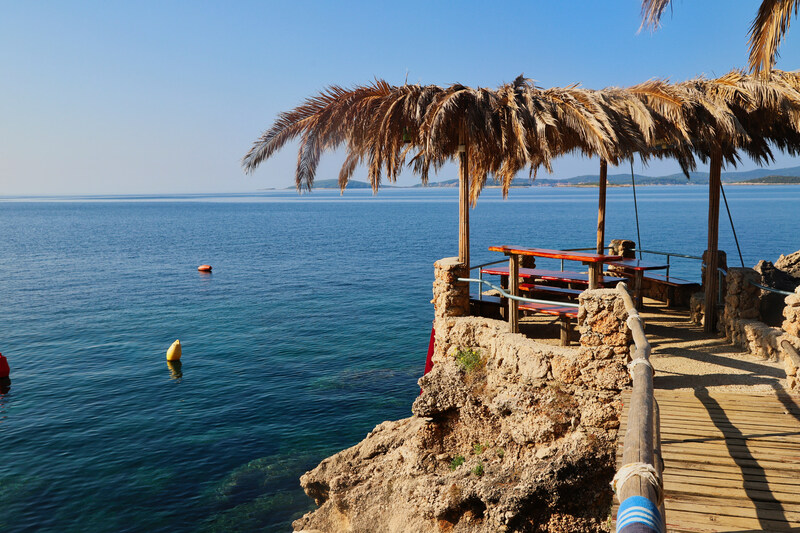 Stunning seaside tables precariously perched on rocky outcrops make for a perfect hideaway for fresh fish, deep conversation, and relaxation. Today the winery produces about 15,000 bottles. Next year Antonio hopes to increase production to 25,000 bottles. “I will never make 300,000 or even 100,000 bottles of wine,” reminding me that this is just a hobby and that their business is hospitality. Even with staffing challenges, the family does well, but everyone works hard. In so many ways, Antonio represents the future of Croatia and the Balkans. He holds no animosity toward who most Croatians feel are their arch enemies, the Serbs, and he’s forging positive change while celebrating the family history and cultural heritage in the vineyard. “The Serbians, many are much poorer, and when we go there, they want to pay for everything, they are so nice and happy.” It’s warming to hear someone so young appreciate his country’s former foe. It’s a total contrast to the conversation I had with a local when I was holed up in Mali Ston, some 60 kilometers away. Once again, Antonio impresses me with his sapience. “Serbian girls like Croatian boys,” he tells me. “I’m okay, it’s okay,” Antonio shrugs off the notion of a girlfriend. He’s young, and I agree that he should focus on his passion. There’s no hurry. He’s funny and giddy as he pours me another glass of the 2016 Don Josip Selection. When he’s called to the kitchen, I realized I’ve devoured the fish, veggies, and rice. The wine is going down easy, too. “You must be from California,” I hear an American accent from a few tables away. Soon we’re joined by David, from Boston but who has been living in Milan, Italy since 1985. After I introduce Antonio as the winemaker and a member of the family that owns the restaurant, he pours praise over him, for the food, ambiance, and environment. “I will come back here in the daylight.” David is staying at a nearby guesthouse. Antonio pours us more wine and David’s wife, with their tiny newborn join at the table. By the time the bottle is empty, and the lights are about to go off we’ve all made new friends and make plans to taste wine, share stories, and learn more about each other. I realize we’ve been talking for over three hours. We all hug, kiss cheeks, and smile. I climb up the walkway to my room, thinking along the way just how much I love meeting people, listening to their stories, and learning.